April 28, 2010 - Red Bull Air Race World Championship program earned a prestigious Sports Emmy Award from the National Academy of Television Arts and Sciences during the 31st Annual Sports Emmy Awards in New York City on Monday Night. World renowned sports broadcasters and personalities, including the legendary John Madden, gathered for the special television awards ceremony held at Frederick P. Rose Hall, Home of Jazz at Lincoln Center located in the Time Warner Center in New York City. The Red Bull Air Race World Championship program, which is broadcast in the U.S.A. on Fox Sports Network (FSN), won in the category: ‘Outstanding Technical Team Remote’ which recognizes the technical portion of sports programs in remote venues. It is the second year running that the Red Bull Air Race World Championship has won in this category. This award is the highest national honor for innovation in sports programming. The Red Bull Air Race World Championship, which is produced in High Definition, is one of the most logistically complex productions. The introduction of flight adds a third dimension to a motorsport, where 15 of the world’s best pilots race individually through a low-level aerial race track made up of inflatable air gates where they reach speeds up to 230 mph. It requires skills from a variety of expert teams to deal with the entire behind the scenes process from the rigging of on-board cameras to capturing the racing footage from the helicopter. The Red Bull Air Race GmbH has built a strong partnership with European companies, West4Media, SiVision, SkyMedia and Riedel Communications to produce the Red Bull Air Race World Championship TV programs from each race along with USA production partner Grace, for post production and final delivery to FSN. Speaking after the awards ceremony, Bernd Loidl, CEO of Red Bull Air Race GmbH, said: “It is an honor to receive an Emmy Award for the Red Bull Air Race World Championship program. Capturing the drama, speed and skill of the world’s best race pilots on the ground and in the air is one of the most challenging jobs in televised sport. The 2009 Red Bull Air Race World Championship program was watched by 270 million TV viewers in 183 countries. As part of the 8-race World Championship, the Red Bull Air Race will make its first ever stop in New York City this June 19 – 20, before continuing on to three other races in Europe. 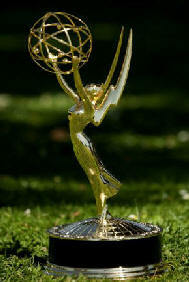 The Sports Emmy Awards recognize outstanding achievement in sports television coverage. For over a quarter of a century, the National Academy of Television Arts and Sciences in the U.S.A. has presented the Emmy as a reward for excellence in sports broadcasting.